Oh boy! It's time for some live lunchtime blogging. Today's treat was on sale for a mere buck (usually $1.50). 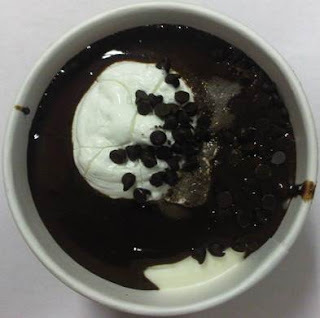 I've had friendly's cups before so my expectations are fairly low, but let's see what happens. 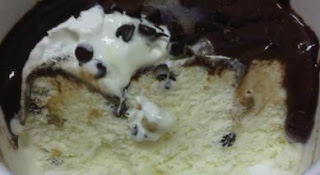 The "Limited Edition" Chocolate Chip Cookie Dough Sundae To-Go is made of vanilla ice cream with cookie dough & chocolate chips, covered with fudge, whipped topping & chocolate chips. i see my first cookie dough bite... ha, I looked more closely and realize it's actually tiny balls of cookie dough. Now that's different! The fudge is overriding pretty much everything, though there are some undertones of cookie dough flavor. mini chocolate chips are bringing some intermittent crunch to the party. the whip cream isnt bad actually, a little weird, but it's a shame there isnt a wallop instead of a dollop. I'm already at the half way point. You know, maybe the problem I've had in the past was I wasn't letting these things melt. That or they've improved their fudge. mmmm, this was definitely the best choice to maximize my dollar. I was going to pick up an expensive pint of something, but this is simpler, plus, as I near the end, I feel a sense of completion, there's no temptation for "just one more bite". good fudge to ice cream ratio, I don't feel like I've run out of either. and it's gone, how sad. I could go for a few more bites, but it's best to quit while you are ahead (i.e. not full). You know, I'm starting to think I was a bit rough on those other Friendly's cups. Ooops, I've officially "mistakenly reviewed something twice" for the first time. I thought I had this one before, but the limited edition threw me off. Well, I did have it before, it was last September actually. 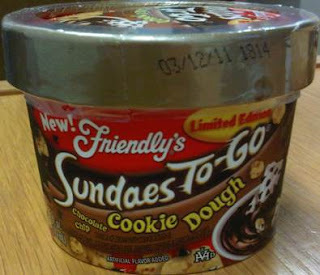 Oh Friendly's, a 9+ month old product really isn't new or limited edition anymore now is it? That cinches it though, I have been a bit rough on these cups. There should be directions on these things to let them sit a bit. I know, I should know this, but when I grab ice cream, I want to eat it now, not wait 5 minutes. Also, I guess I should have tried "original sundae" instead, but like I said, I wasn't 100% sure which one I hadn't tried. There's also a "Jim Dandy" banana split type sundae to-go, but that doesn't really interest me.